The Tower Bridge in London is quite a beautiful sight. It's a gorgeous structure that you wish you could look at every day because it is so breathtaking. Fortunately, with the right dorm wall art items, you can look at this amazing bridge every day! Your college dorm room may not have a scenic view you like. You can easily fix that and not by changing dorm rooms! Simply add scenic views like our Tower Bridge London College Poster to your dorm room decor. You can even place this dorm essentials item by your college dorm window. That way, when you go to look out the window, you can have an amazing view of the Tower Bridge right next to it, making your view more inspiring. 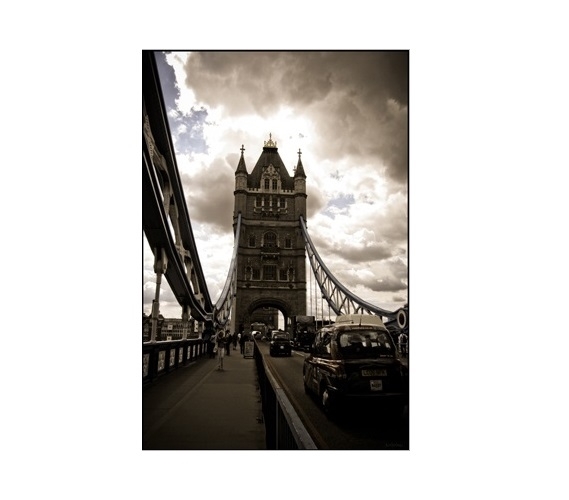 Our Tower Bridge London dorm poster features a photograph that is taken right on the Tower Bridge. When you see scenic views of famous bridges, it is usually a photograph taken next to the bridge. However, this dorm necessities item is unique because it is taken right on the Bridge. In the backdrop of this gorgeous photograph is a blue sky with white and gray clouds that make this college wall decor item stand out even more.